Deputy Consul General Hiroki Matsuo with Beiju honorees Cliff Nakatani, Alice Kikkawa and David Kikuchi. 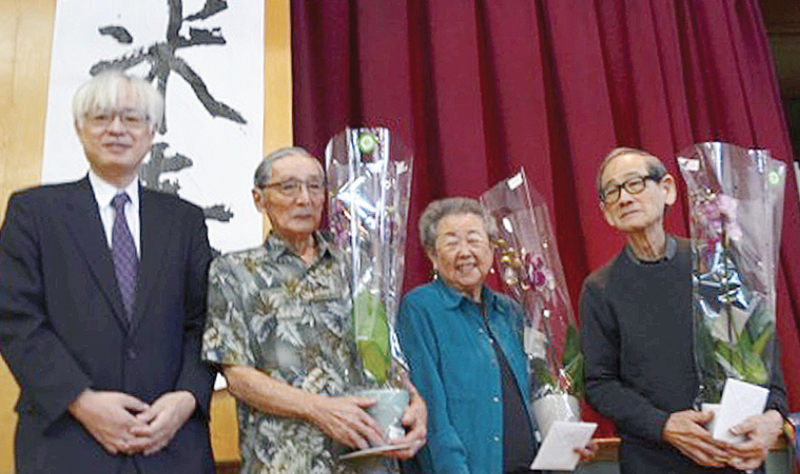 The Pasadena Nikkei Seniors (PNS) welcomed in the Year of the Boar at their annual New Year’s party on Jan. 27 with over 200 members and guests in attendance. Pasadena Mayor Terry Tornek and Deputy Consul Hiroki Matsuo, representing the Consulate General of Japan in Los Angeles, greeted the crowd with warm words of welcome. Also extending New Year’s greetings were 2018 Nisei Week Queen Alice Amano and her fellow princesses, including Miss Pasadena JCI Juli Drindak. An annual highlight of the party is the recognition of PNS members turning 88 years old in the coming year. In Japanese culture, the 88th birthday is celebrated as Beiju, or Rice Age, and is a milestone deserving special recognition. This year Alice Kikkawa, David Kikuchi, and Cliff Nakatani were honored for attaining that significant age. 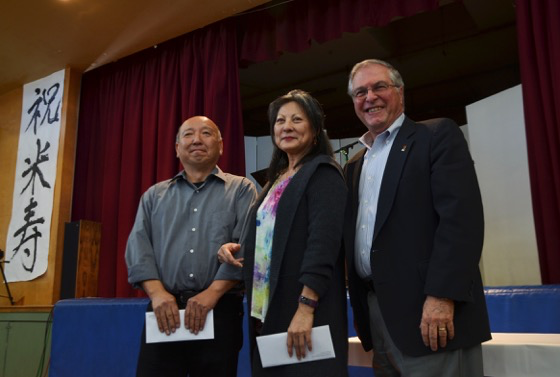 Also honored were Gini Ishida and Ron Ota for their “above and beyond” volunteer service to the Pasadena Nikkei Seniors and the Pasadena Japanese American community. Ishida is a baker extraordinaire who has been serving up delicious individual desserts for attendees of the monthly PNS luncheons for the past two years. And whenever a community event needed a sound system, be it indoors or outdoors, Ota was the man to call for setting up speakers, microphones, amplifiers or anything else necessary for providing exceptional, quality sound. Community service honorees Ron Ota and Gini Ishida with Pasadena Mayor Terry Tornek. The Pasadena Nikkei Seniors were recipients of a grant from Keiro subsidizing the cost of its monthly luncheons and bus transportation for one- or two-day trips, and Keiro representative Makoto Kotani was in attendance to present the grant check to Scott Shinmoto, author of the PNS grant proposal. Jake Matsumoto, an eighth-grade student from Flintridge Prep High School, was on hand for a community service project, manning a booth to collect “Words of Wisdom” from PNS members that he planned to compile and share with his peers. Local singer/guitarist Ken Okuno provided entertainment, singing songs from the ’30s-’50s composed and sung by artists such as Hoagy Carmichael and Nat King Cole.